Infuse fresh herbs and spices into your favorite EVOOs and measure down to the teaspoon with this bottle. Add a refreshing touch of cilantro to your salad dressing, a hint of basil to pasta sauces, or an unexpected taste of rosemary to your seafood dishes. Essential for quantity-conscious diners and flavor-obsessed gourmets, this glass bottle infuses essences from your own herb garden into your favorite olive oils. When the fresh flavors are blended, press the button and measure the proper amount down to the teaspoon. Made in China. 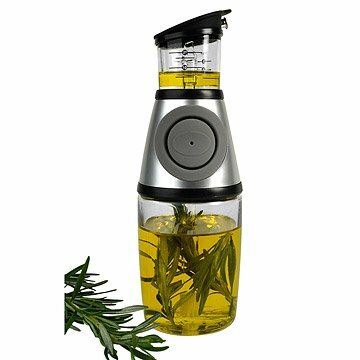 View instructions for the Press and Measure Herb Infuser . We love infused olive oils and spend a lot of $$ on them. While we will still purchase some - this allows for a lot of experimenting. Rosemary - ++ Basil - ++ Still trying to get the lemon infused perfected. Really a lot of fun and a great conversation piece with friends and family. The infuser is easy to use and makes measuring oil easy and accurate. Quality product although it does look a bit cheap so idk if I would display it on the table for a fancy dinner. This thing is fantastic! I added a few rosemary stems & a halved clove of garlic to olive oil. It's absolutely delicious! We love it on salads, or we'll drizzle it on flatbread or over steamed veggies. It's very sturdy and easy to use. Thus far I've had no complaints. Infused olive oil with rosemary and thyme. Perfect gift for those who love cooking and creating. I gave this to my brother as a Christmas gift and he loved it! He immediately came up with ideas to use it for outside of the oil and herb. He is looking forward to using it! Use to infuse Olive oil with herbs for cooking and dipping. Good gift for any relative or friend who likes to cook! Use this to infuse olive oil with my home grown herbs. Makes unique flavors which you can adjust the intensity of. Very easy to use and clean. I would buy this again for cooks!